Permission is hereby granted for reproduction of any figures in Neuman, B., & Fawcett, J. (Eds.) (2011). The Neuman systems model (5th ed.). Upper Saddle River, NJ: Pearson. Neuman, B., & Fawcett, J. (Eds.) (2011). The Neuman systems model (5th ed., [insert page number(s)]). Upper Saddle River, NJ: Pearson. Reproduced with the permission of Betty Neuman and Jacqueline Fawcett. Neuman, B. (2005). 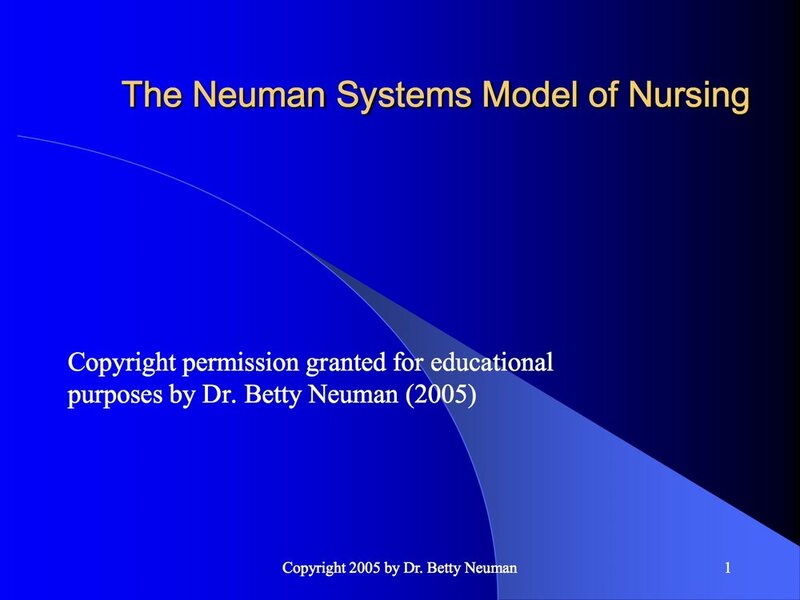 The Neuman Systems Model of Nursing [overview of the Neuman Systems Model]. Copyright permission granted for educational purposes by Dr. Betty Neuman (2005).